As big mouse updated you all, I was in Barcelona last week for work hosting media on a press trip for HTC. I was there to take the press on a whistle stop tour of the El Raval and Las Ramblas areas - the Brick Lane of Barcelona or so I'm told. Apparently it's THE place to live if you're a hip and happening Barcelonian! Packed full of authentic Spanish tapas restaurants, edgy vintage clothing stores, beautiful art gallery space... need I go on? 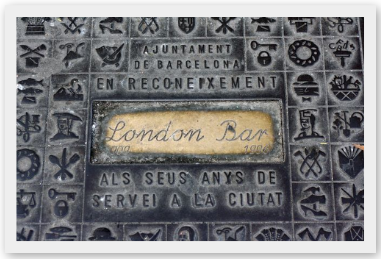 YES I must, because I have kept the best till last - The London Bar. 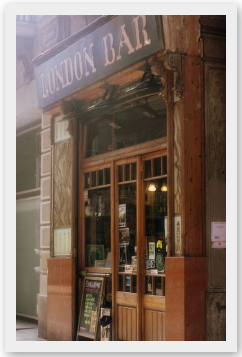 Over 100 years old, making it one of the longest running bars in Barcelona, this was the place to be seen if you were a musician, writer or artists back in the day - Gaudi, Picasso and Hemingway were all locals ... how cool?! Its rundown, art deco interior is shabby yet chic from an old piano collecting dust in the corner, to the intricate uneven tiled floor, to the faded glitter chainmail backdrop where live music artists perform each night. I love the thought that the place probably hasn't changed all that much since Gaudi and the gang used to hangout there. Almost like its frozen in time. Stop off for a seriously strong coffee or drop in for a swift nightcap - whatever takes your fancy make sure you experience this charming slice of history in some shape or form. You have to see it to believe it and I guarantee you'll love it. Hi to every single one, it's truly a good for me to pay a quick visit this web page, it includes useful Information. Wow, that's what I was searching for, what a material! existing here at this webpage, thanks admin of this site.